Definition: The Balanced Score Card is a tool used to evaluate the effectiveness of Human Resource Management and is developed by Kaplan and Norton. In this method, the HR evaluates not only the financial performance of the organization but also takes into the consideration the key performance indicators of customer service, internal business process and learning & growth achieved by the organization. Financial Dimension: The management can determine the long term and short term financial performance of the organization that results from the actions undertaken by the management during the financial year. Customer Service: Through this dimension, the management tries to find out the perception of customers towards the organization and also the customer retention and satisfaction levels. Business Process: Under this, the management evaluates the efficiency of the production processes in terms of, how well the order was processed, when the delivery was made, and what was the cost incurred per order. Learning and Growth: This dimension talks about if any new technology or novice product introduced in the organization, the customer retention and the efficiency of training programs conducted for the personnel. It focuses on how well the organization’s resources were utilized; that results in the overall growth of the organization. 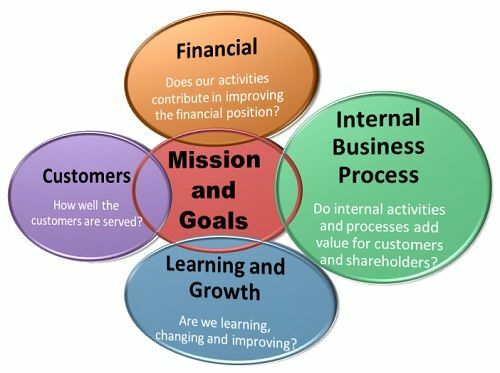 Earlier, the evaluation tools just focused on the financial performance of the organization through its past records, but with the balanced scorecard, the organizations can keep a track of past as well as forecast the future performance of its operations.